Where to Celebrate Oktoberfest Around Washington, D.C. When it comes to celebrating German heritage, communities around the Capital Region host some of the best Oktoberfest events in the United States, with dozens to choose from in Virginia, Maryland, and Washington, D.C. Many communities in the area hold Oktoberfests, a local version of the famous fall festival held each year in Munich, Germany. These Oktoberfest events are family-friendly and focused on German beer, food, music, and dancing. While these aren't the only beer festivals in the D.C. area, they are some of the best. 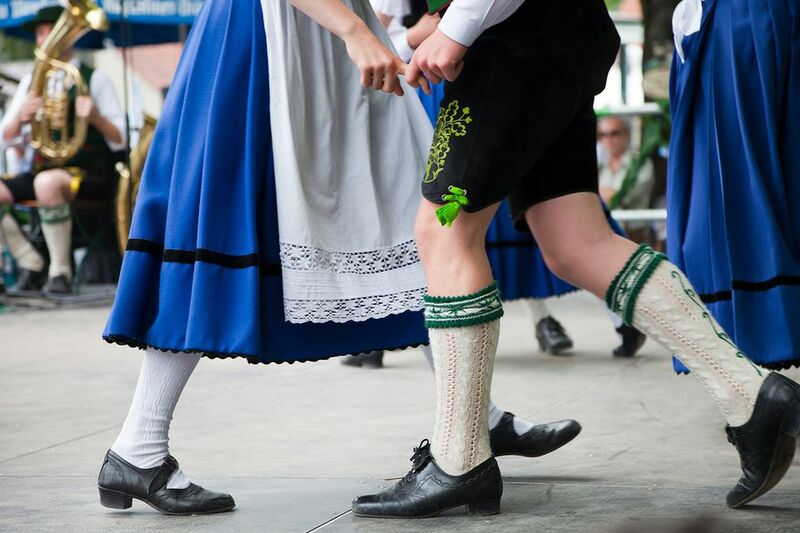 Whether you have German ancestry or just want to take part in a different cultural experience during your trip to the Capital Region, these Oktoberfests, Bier Fests, and special events are memorable. Held in October, this beer festival features more than 300 different ales and lagers as well as multiple food vendors, live music, DJ performances, and recreational and family-friendly activities. Events take place on Pennsylvania Avenue NW between 3rd and 6th Streets in the heart of downtown Washington, D.C. The price of admission benefits the Arcadia Center for Sustainable Food & Agriculture, but drink and food tickets are sold separately. The popular Williamsburg, Virginia, amusement park destination Busch Gardens hosts its annual Bier Fest from mid-August to early September. You can sample a variety of beer and traditional German food while enjoying live music in this unique Bavarian celebration. The Oktoberfest celebration features 75 beer varieties representing 10 countries, including Southeast Asia, Europe, and the United States; several selections from Virginia-based craft brewers also will be on tap. Access to Bier Fest is included with park admission. From late September through mid-October, you can experience Oktoberfest by testing your skills in the world's oldest, noblest drinking game known as Stein Hoisting at the Biergarten House in Washington, D.C. This Bavarian pub offers its regular 12 drafts and 11 additional Oktoberfest drafts, food, and live music performances. The beer hall in the NoMa neighborhood of D.C. features a week of Oktoberfest events including Bavarian food and drink, music, dance, and games. Draft beers are served in Oktoberfest Märzen-style that hail from Bavaria's oldest breweries like Spaten, Weihenstephaner, and Hofbräuhaus, and are accompanied by a select lineup of seasonal locally brewed beers. Café Berlin will provide authentic German fare, including grilled bratwurst, bauernwurst, bretzels und obatzter, original potato salad, gurkensalat, and sauerkraut. Lovettsville was originally known as The German Settlement before it was established in 1836 by the Virginia General Assembly but went on to be a major destination for German settlers who moved from Pennsylvania. In celebration of the town's German heritage, the community in Loudoun County, Virginia, celebrates Oktoberfest with food, crafts, and entertainment in September. Each year, a Queen of Oktoberfest is crowned who will be roaming the streets enjoying the festivities. The Frederick's Oktoberfest, presented by the Rotary Club of Frederick County and sponsored by Flying Dog Brewery, takes place at the Frederick Fairgrounds and is broken into two days. The first night is a 21-and-over event featuring an opening ceremony, keg tapping, Oktoberfest games, and live music. The following day, the whole family can enjoy kids' German games and activities, a German spelling bee, a German genealogy workshop, a root beer luge, yodeling contest, strongest man and woman contest, and musical performances appropriate for all ages. Das Best Oktoberfest takes place in October, at the M&T Bank Stadium Lots in Baltimore, Maryland. The festival includes over 150 unique beers, German wines and schnapps, German foods and other festival goodies, Oompah bands, live music, and contests for kids and adults alike. Children under the age of 13 get in free. Now known as Flavors of Fall, Oktoberfest at the Reston Town Center in Reston, Virginia, is a staple of the region. Here, you can sample the best in fall brews and traditional Oktoberfest fare provided by some of Reston's finest eateries while enjoying live entertainment. Admission is free to the event, which takes place in early October. Enjoy live music, food trucks, games, plenty of lager, and lots more at the annual Port City Brewing Company's Oktoberfest celebrations, which start in early August, and take place sporadically through early October. Port City Brewing Company usually releases a limited run of its Oktoberfest brew in honor of this classic German festival, so don't miss your chance to take home a growler of it. The Kentlands Village Green in Gaithersburg, Maryland, hosts a family-friendly Oktoberfest featuring Bavarian music, dance, food, crafts, pony rides, moonbounces, pumpkin decorating, and face painting. The City of Gaithersburg and the Kentlands Citizens Assembly sponsor this annual event. Washington D.C.'s official kickoff to the German holiday takes place in the city's Chinatown neighborhood. You can explore local bars including RFD, Penn Social, Jackpot, Iron Horse, Fado, Rocket Bar, and Austin Grill for beer specials and entertainment. A portion of the proceeds from the event goes to local charities. Check Out These March Festivals and Events in Washington, D.C.
Guide to 2018 Charity Walks in Washington, D.C.
Eat Out for Christmas This Year in Washington, D.C.
Find Unique Gifts this Season at Holiday Markets in Washington, D.C.
What to Do in November in Washington, D.C.